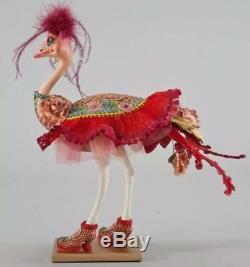 Katherines Collection Bohemian Ostrich Tabletop Decor. From the retired La Fete Boheme Collection. Fun colors of red and pink. Many items sell out and cannot be ordered. I specialize in new Katherine's Collection and retired Katherine's Collection. Katherine's Collection specializes in unique handmade dolls and collectibles. The quality in their items is like no other in the industry. I have personally been to their headquarters and have seen first hand the magic that these talented craftmakers put to life. From the designs created by ones imagination not a pattern! Katherine's dolls are and made in limited editions and are retired after one or two seasons which makes them highly collectible and increase their value. If an item has a Wayne Kleski tag, it was designed by him. Brand new merchandise from Katherine's Collection is not designed by Wayne Kleski. I have owned and operated a retail store for 16 years. PLEASE DO NOT MESSAGE ME FOR PRICE INQUIRIES ON YOUR KATHERINE'S COLLECTION ITEMS. Save me to your favorites... I'm listing as fast as I can! Many more exciting items come! I CAN BE REACHED AT BINGHAMS ANTIQUES WITH ANY QUESTIONS. The item "Katherines Collection Bohemian Ostrich Tabletop Decor 28-728527" is in sale since Saturday, November 17, 2018. This item is in the category "Collectibles\Holiday & Seasonal\Christmas\ Current (1991-Now)\Figures\Other Curr. The seller is "jpc1016" and is located in Cleveland, Ohio. This item can be shipped to United States, Canada, United Kingdom, Denmark, Romania, Slovakia, Bulgaria, Czech republic, Finland, Hungary, Latvia, Lithuania, Malta, Estonia, Australia, Greece, Portugal, Cyprus, Slovenia, Japan, Sweden, South Korea, Indonesia, Taiwan, Thailand, Belgium, France, Hong Kong, Ireland, Netherlands, Poland, Spain, Italy, Germany, Austria, Israel, Mexico, New Zealand, Philippines, Singapore, Switzerland, Norway, Saudi arabia, Ukraine, United arab emirates, Qatar, Kuwait, Bahrain, Croatia, Malaysia, Chile, Colombia, Costa rica, Dominican republic, Panama, Trinidad and tobago, Guatemala, El salvador, Honduras, Jamaica, Antigua and barbuda, Aruba, Belize, Dominica, Grenada, Saint kitts and nevis, Saint lucia, Montserrat, Turks and caicos islands, Barbados, Bangladesh, Bermuda, Brunei darussalam, Bolivia, Egypt, French guiana, Guernsey, Gibraltar, Guadeloupe, Iceland, Jersey, Jordan, Cambodia, Cayman islands, Liechtenstein, Sri lanka, Luxembourg, Monaco, Macao, Martinique, Maldives, Nicaragua, Oman, Pakistan, Paraguay, Reunion, Bahamas, China, Uruguay.